In some cases, doctors and hospitals shift to cheaper alternatives. The price for Ofirmev has increased to $42.48 per vial, from $12.90 when it first came to the United States. (Bloomberg) — Early last year, drugmaker Mallinckrodt PLC spent $1.3 billion to buy a company that sold an injectable form of acetaminophen — essentially Tylenol in a liquid solution. Within months, the new owner more than doubled the price of the drug, called Ofirmev. Revenue from the medication shot up, too, and hospitals searched for ways to absorb the costs — large hospital systems like Johns Hopkins Medicine and New York University Langone Medical Center say their expenses surged $1 million a year or more. It’s the same story that’s been repeated throughout the health care industry, as pharmaceutical companies acquire medications and hike their prices to reflect what they say is the fair value of the drugs. That industry practice has come under fire in recent weeks from lawmakers in Washington. In this case, hospitals were able to fight back by seeking other options, cutting into Mallinckrodt’s projected sales growth. In the fiscal third quarter, which ended in June, revenue from Ofirmev came in at $62 million. While that was a 17 percent increase from a year earlier, analysts had been estimating 37 percent growth on average, according to BMO Capital Markets. That and shortfalls for other drugs were part of a Mallinckrodt earnings report Aug. 4 that sent shares down 14 percent in a single day, their worst drop on record. The stock has slid an additional 38 percent since then amid a broader sell-off of pharmaceutical company shares as political scrutiny of the industry’s drug prices has intensified. A Mallinckrodt spokesman said the cost of an entire course of treatment of Ofirmev is $100, compared with a surgical procedure that may be in the thousands or tens of thousands of dollars. Since the company acquired the drug, a number of publications have shown the value of using Ofirmev and cutting the use of opioids, the spokesman said. Mallinkcrodt said on an August conference call that it had expected a drop in Ofirmev volume after the price increase. The drugmaker has turned a “not particularly profitable drug” into a profitable one — part of a strategy that has been “very successful,” Chief Executive Officer Mark Trudeau said at a June investor conference. Trudeau said on a conference call last week that Ofirmev demand is starting to turn a corner after hitting a low point earlier this year. He said revenue from the drug will decline year-over-year until the second half of fiscal 2016. That fiscal year just started and will end on Sept. 30. Mallinckrodt’s experience underscores the risk for drugmakers that increase prices on medicine that doctors and health care providers are already accustomed to using. As expenses mount, customers will look for alternatives, no matter how popular or useful the product. While acetaminophen has been around since the 1950s, Ofirmev is a relatively new drug, having hit the market in 2011 after approval by the U.S. Food and Drug Administration. The company that first sold it, Cadence Pharmaceuticals Inc., had acquired the exclusive rights to the drug in the U.S. and Canada in 2006 from Bristol-Myers Squibb Co., which had been marketing the drug in Europe. Cadence successfully sued to protect its patent for Ofirmev, fending off a challenge from Exela Holdings LLC in a 2013 ruling in U.S. District Court in Delaware. Mallinckrodt acquired Cadence soon after. Ofirmev’s price had been on the rise even before Mallinckrodt bought it. According to data provider DRX, the price has increased 229 percent since the medication was introduced at $12.90 a vial. Cadence had increased the price to $17.70 a vial by the time it was acquired by Mallinckrodt. After the deal, Mallinckrodt raised it to $42.48 a vial, on an average wholesale price basis. CEO Trudeau said Mallinckrodt doesn’t try to boost sales growth by acquiring drugs and raising prices on them. “We typically don’t look at deals from the perspective of the only way it’s going to work is if we’re able to take significant price increases,” he said on the conference call earlier this month. Ofirmev is projected to be Mallinckrodt’s second-biggest-selling product this fiscal year, with $276 million of sales, according to analysts’ estimates compiled by Bloomberg. Trudeau said in August the drug’s sales could potentially grow to $500 million a year when it hits its stride. 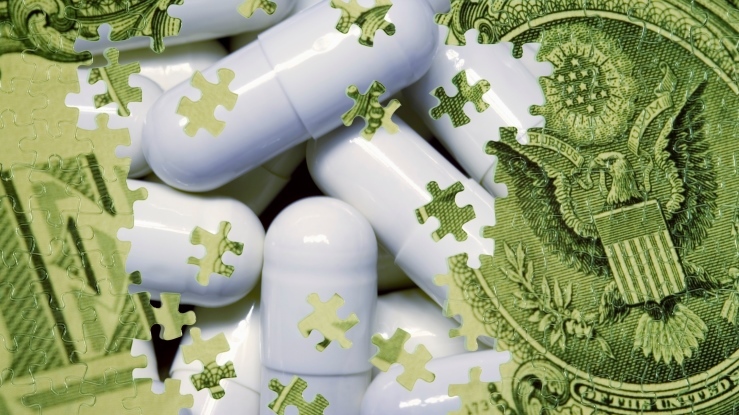 The price increase paid off for Mallinckrodt at first. Sales of Ofirmev were $71.4 million in the fiscal first quarter, which ended Dec. 26. That was more than double the result a year earlier, before Mallinckrodt owned the drug. But use of the drug dropped after the price hike, then stayed flat for six to eight months, Trudeau said at an investor conference in June. At its worst point, volume had fallen 30 percent from its peak, he said on a conference call in August. Some formularies — the prescription drug plans insurers use to determine which drugs to pay for — dropped the drug altogether, or restricted its use, the company said on the August call. Some hospital systems ended up paying the additional cost. Johns Hopkins Medicine said it was faced with an additional $1.24 million a year in extra costs for Ofirmev. NYU Langone, anticipating $1 million in additional costs due to the higher price and frequent use of the drug for surgical patients, rushed to find alternatives. For some patients, that meant using the pill form. For others, that meant single doses rather than repeated ones. To woo customers that restricted use of the drug, Mallinckrodt is showing that the medicine has the potential to get patients discharged faster because it may not affect people the same way other painkillers do. Still, the price hike made some customers reflect on whether they needed to use Ofirmev as often.